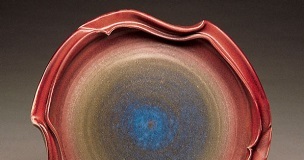 Undulating Rim Platter, 16 inches in diameter, wheelthrown and altered white stoneware, with Blue-Green/Copper Red Glaze sprayed over scrap glaze, red to Cone 6 in reduction. There are a lot of traditional reduction glaze recipes out there, and they are typically formulated for firing at cone 10. But Rick Malmgren decided that he wanted to fire lower and still use a lot of these traditional glazes. So he set out to reformulate and adjust these cone 10 glazes to function well as cone 6 glazes. What he found was that he not only saved time and money, but he also ended up with some gorgeous glazes. Today, Rick explains the benefits of firing lower and shares some of his great cone 6 reduction glaze recipes. -Jennifer Harnetty, editor. Lovely traditional glazes look as good as or better fired at Cone 6 than they do at Cone 10. Copper reds, Shinos, temmokus and dolomite mattes are virtually indistinguishable from their Cone 10 brethren. Some Cone 10 glaze recipes don’t even need to be adjusted— a few look just great at Cone 6. Fuel savings amount to about 30% over a Cone 10 firing. Granted, that isn’t much per firing (only the cost of two coffee mugs per kiln load, as Pete Pinnell once said), but if you are burning $2000 worth of propane per year, as I was a few years ago, it amounts to a nice $600 bonus at the end of the year. The savings in fuel costs is nothing, compared with the savings of time and energy. Being able to fire off a full kiln load in 7½ hours instead of the 10½ that it used to take me is where the real savings comes in. At Cone 6, I can fire during the day and teach at night, on a more normal work schedule. Though I’ve fired my kiln more than 700 times, each ring takes its toll. The hotter it is red, the harder it is on the arch, the walls and the shelves. There is that much more expansion and that much more contraction, and that much more slumping. Cutting the temperature saves all the way around. Mountains of research have already been done for Cone 6 oxidation, resulting in thousands of recipes. Oxidation potters have had to work hard with formulation to bring vitality to their glazes; they can’t depend on the atmosphere to do the work for them. Many of those same recipes fired in a reduction kiln are simply dazzling. The following are my favorite recipes. oxidation, reduction, set, slumping, stoneware. Reading these comments makes me dizzy. These clay artists spend thousands of hours developing spectacular glazes and are willing to share them with us. I, for one, prefer to embrace their passion for the mysteries of chemical combinations, and I thank them for their contributions. Every glaze formula works a little differently in each person’s lab for a variety of reasons, and it’s up to us to do some experimenting rather than whining that we’re not spoon-fed perfection. The backbiters need to get a life. 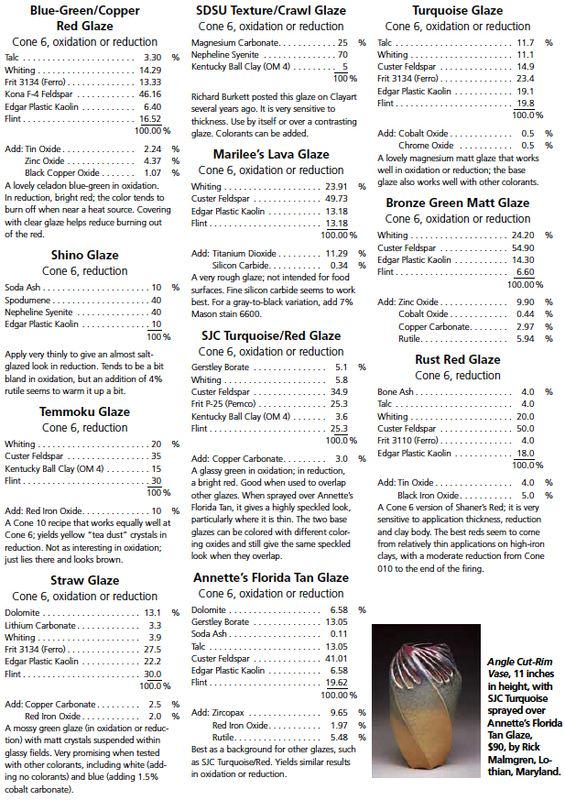 For help with converting glaze recipe percentages into the correct gram weight, you can use GlazeCal. Even for those of you who know the formula, GlazeCal makes the process much easier, saves time and reduces error. I use it in my studio every time I make a new glaze. The math is easy, but I’m glad I don’t have to do it and can spend my time on the things I love – like making more pots. Hope this helps! I’ve been experimenting with my cone 6 oxidation glazes in a reduction kilm. I’ve had some very good results, and also some very surprising ones. I have also incorporated some of my old cone 10 glazes and reduced them at cone 6 and more of them came out well. I really appreciate the article and the glazes. Thank you very much. @Lee-What can I say? I have no problem learning about any firing range. Maybe you can do an article sharing your low fire techniques. John, For one thing, I like to help people get over the chicken little fear of traditional glaze materials and processes. Fear is a thing to base decisions on. Reason and knowledge is much better. I am working at cone 3 doing a lead free fritted glaze on terracotta and am having luck with an amber glaze. There is no need to try and copy cone 10 glazes at cone 6. They always look like copies. You loose the primary purpose of working at high fire: the nuanced things that happen to clay body and the interaction between the body/glaze that is absent at lower temps. I’ve more interesting glazes working with tradition lowfire processes. And too, you can choose to use renewable fuel sources to fire at high temp. I find cone 13, using recycled wood the most rewarding. Jim and Others- I’m not saying that cone 10 is better than lower temperatures but too often cone six (or other temps.) get compared to cone ten surfaces to show how nice they might be. I’m just saying if you want cone ten-type results, fire to cone ten… if you want cone six results fire to cone six and I agree with Lee, if you really want to save fuel, kilns and time, fire even lower or use paint. For the record, my work gets fired to whatever temperature the surface might need and currently I fire to cone 02. @ Lisa – I was referring to the link Lee had posted to the Shoji Hamada galena glazed charger. Galena is a lead containing compound. Lee’s suggesstion of going low fire instead used a lead glazed example, rather than a safer, contemporary low fire example. The glazes in this article contain no lead, as you correctly point out. I am very much in favor of the ideas in the article. Bravo to Rick Malgren, John Britt and Diana Pancioli for promoting Cone 6 reduction as an alternative. @Terri — you may want to read a copy of “The Art of Firing”, by Nils Lou. You may also want to talk with people who have done lots of reduction firing, but you will find that there are conflicting opinions about protocol. As to reducing in an electric kiln, it may be dicey. There have been reports of damage to the heating elements, but Nils seems to be able to get reduction without much (if any) trouble. @Margaret — Because cones register heat work, and are not thermometric, it is not at all easy to equate a cone number to any one temperature. In fact, in any final sense it isn’t possible. Depends on how fast the kiln is heating, which in turn depends on how heavily the kiln is loaded, how large a burner you have, and several other factors. (Notice that the Orton charts list at least 2 temps for each cone #. There is good reason for this.) I have seen my little test kiln reach cone 10 at temperatures ranging from about 1296 Celsius to 1319 Celsius, depending on how fast the firing went. There may be some measurement error, but I’m using a Type S (platinum) thermocouple, so those numbers are somewhat more trustworthy than the numbers you get with a Type K.
@everyone — I am _seriously_ with @Sherman about never mixing large batches of glazes you haven’t tested. That’s just looking for trouble. Many thanks to Rick for the development work and the recipes. Brian, some of us fire to cone 6 NOT because we’re looking for cone ten results but because we’re looking for the superior results we get at cone 6. I would fire to cone 6 even if the negatives were reversed and it took more energy and time and wear on the kiln to get to cone 6 than to cone 10. Brian, it is true that the temperature difference between the cones is not that great (Orton lists it at about 110F), but at high temperatures like this, the amount of energy needed to raise an entire kiln that last 100 degrees is significantly more than what’s necessary to get 100 degrees earlier in a firing. This is a lot less energy—and cost—and less wear and tear on your kiln. But, of course, I’m not here to preach. Everyone’s got to fire what they want, how they want, in order to get the results they want. I don’t think you’re alone in your perspective—and I’m glad it works for you. Many thanks for your great tips for Cone 6 glazes and hope I can save the firing cost. Margaret, a pyrometric cone 6 will bend at various temperatures depending on the rate of heat rise. The reason for this is that pyrometric cones measure heatwork, which is the combination of temperature and time. The faster the heat rise (degrees per hour), the higher the temperature needed to bend a given cone. A good example of this is firing to cone 5 and holding the temperature steady at that point; cone 6 will fall in about 15-20 minutes. The only way to know is to fire your normal firing cycle with cone packs in the kiln and note the relationship between the final temperature and the position of the cones. I don’t often use cone 6 glazes, so pardon my inexperience. Can these glaze recipes be fired in an electric kiln with similar results? Here’s my feelings on this issue and it comes up regularly: The difference between cone 6 and cone ten is a little over a hundred degrees fahrenheit. With a properly designed kiln this shouldn’t take more than a half an hour firing time. Switching to cone six takes a lot of formulating and testing, often means under-fired clay and people who know can tell the difference even though you think you’re getting “cone ten” results. YOu have these great cone 6 recipes, can you please tell me what temperature you call cone 6 e.g. 1200, 1220 or 1240. I have been firing at cone 6 for years. I have never done a reduction firing and haven’t the slightest idea how to do it. Can I do it in my electric kiln? How? Thanks so much! I have been firing cone 6 reduction for 8 years, using these glazes and others. I am glad I can attribute these glazes to you. Until now I just had a xerox copy of this page of CM. One question: have you noticed that any of your glazes are less durable than cone 10? Some of my temmoku bowls (this recipe) that have gone through the dishwasher a lot are clouded. If you already know how to fire cone 10 reduction cone 6 reduction is just about the same. in ^6 I put the kiln into reduction 2 cones, for me thats at ^08, earlier then I would with ^10 and keep it in a medium to light reduction through the rest of the firing. Then at the end I fire down still in a light reduction to about 1200 degrees at about 200 degrees per hour. if you have a large fiber kiln you may be able to skip the down fire. Could someone tell me how to do a cone 6 reduction step by step. I have the kiln, just not sure how you do the firing. I have talked to people and read books on the cone 10 reduction but have not be able to find any info on how to do a actually cone 6 reduction ie timing, temp etc. What’s up with the negativity? If you don’t like the idea don’t use it and if you suspect wrong info ask first and then critique constructively. There’s always something to learn from another artists process. Thanks for the info Rick and the work put into getting it out to us. Hello Rick. So good to see your article on cone 6 glazes. Thank you for the recipies. I have been temped to switch from cone 10 to 6 for all of the reasons you gave. Did you purchase a cone 6 clay body, or did you reformulate your cone 10 body? Charlie: all the recipes are in percentages. You can convert all of them to a larger batch pretty easily. Most of the time, you can get about 8,000 to 10,000 grams of dry glaze (plus added H2O) in a 5-gallon bucket. A good place to start with consistency is a little less water than dry materials (maybe 6 or 7 liters for 8,000g), then add a little at a time until it is how you like it. If you do your glazes in lbs, then divide your grams by 453.59 (that’s how many grams are in a lb), and a quart is a little more than a liter. Lee: Yes, lead glazes are very pretty, but try to sell something functional with a lead glaze these days. Everyone that buys something from me asks to make sure there is no lead. I’ll keep my high-fire glazes, thank you very much. @ John The recipe for the Copper red glaze is right there, and there is no lead in it, so what are you talking about? Charlie, first of all DO NOT mix an entire 5-gallon bucket of any glaze you have not tested in smaller batches first (a few hundred grams). A 5-gallon bucket usually holds a 10,000 gram (dry weight) batch of glaze. After you’ve tested a smaller batch, then you can scale the batch to whatever size you like. To do this, divide the desired batch size (10,000) by the current recipe total (100) and then multiply the result (100) by each material amount in the recipe to get the amount of each needed for your final batch. Each glaze is going to vary in its requirements for water. A general rule of thumb is 50% water by weight, but don’t start with that much. Slake the dry ingredients into about half that amount of water and add more as necessary. Happy testing! A recipe is set at 100% meaning you could use 100 grams, 100 ounces, 100 pounds, etc. I use grams thus the recipe is 100 grams. To make a larger volume, mutiply each ingredient by the number of times you need. For a 5 gallon bucket I make a 5,000 gram batch. I use a spredsheet and have the recipes listed. The first column is the orginal amount, the second and remaining columns can be for the amounts you would need. I make a column for a “test batch” at 500 grams. Thus I multiply that amount by 5. For a 5 gallon bucket I take the amount of each ingredint and multiply it by 50. This gives you a 5,000 gram batch. I add enough water until you have the desired thickness. I use a hydrometer and most of my glazes I add water until it reads 1.5 or 1500 depending on the grauduation marks on the hydrometer. This is for Charlie- Charlie, the recipes are in percentages. Therefore, if you mixed 1 gram of glaze ingredient for each one percent, you would end up with 100 grams of glaze. (plus any additional ingredients added to the recipe for coloring, effects, etc.). Now, if you mixed one ounce of glaze ingredient ( a lot more than a gram ) for each percent of glaze ingredient, you would end up with 100 ounces of glaze. Take the 100 ounces of dry glaze and divide it by 16 (number of ounces in a pound). That number will be the pounds of dry glaze material to be mixed with water. Put your 2 gallons of water in a 5 gallon bucket experience aside for now. That 100 ounces of dry glaze material (6.25 pounds+) will provide over half a 5 gallon bucket of glaze. The amount of water you add depends on the glaze, how its fired,etc. Try adding enough water to the dry ingredients to get to the consistency of the glaze you have had experience mixing, try it out, and then make adjustments to the water amount if needed. Lee, your example appears to be glazed with a lead compound, not the best example of what to do in these days. that should read “Imitate” other glazes not, “immediate”. Nice platter. Thanks for the recipes! I have a question about the recipes. How much does each recipe make in gallons??? Or rather if I use a five gallon bucket to mix in how much water does the recipe take??? I have been making a glaze that has two gallons of distilled water in a five gallon bucket. Would like to make some of these glazes??? Can you help?? ?